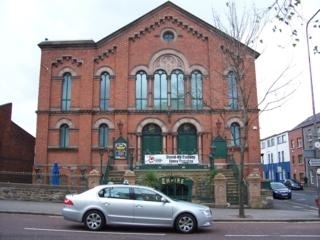 The Empire Music Hall is a live music venue in a busy area of Belfast. The Empire,which was once a church is located beside Botanic Railway station. The bottom bar serves great value food and, at night, becomes a hive of activity for beer connoisseurs. During universtity term time (September - June), Belfast\'s longest running comedy club attracts top acts attempting to win over one of the toughest audiences on the circuit. You can also find a range of other live acts at the Empire, so check the website for a list of upcomming dates. The bar downstairs is a good spot for a quite pint during the day and you can catch the next train home! Have you got Google Earth on your computer? If so, then download the Google Earth view of The Empire. Is this the wrong position for The Empire? If you think so, then modify its position. Click / Tap the button above to get directions from where you are to The Empire. Attended the Elvis spectacular last night came out of the downstairs bar with our drinks the bouncer told us yes go round join the queue and you can take ur drinks with you !! got to door of the event and another bouncer was so rude and told us to drink them before we could go in !!! after I told him that the other bouncer let me out with them and that it was there lack of communication with each other he eventually agreed on this occasion to let me in. I think the empire should get there security staff to communicate with each other better and maybe take a course in people skills and learn how to speak to people !! I really love this pub. They always have great music like blues guy on Thurs and Ken Haddock sunday band. I think the staff are very friendly. Good for a night out and i go there to watch the ireland rugby matches, luv it. Dont notice the doormen much, theres never any bother. totally agree with comments below about door staff- stand and text or facebook all night on their phones, dont even look up at you walking in, cretins. bar staff are ok but dont smile or look like they are enjoying their job in the slightest. toilets are stinking and the whole place has gone really down hill. if only ken haddock played somewhere else in beldast on a sunday night then wouldnt have to suffer the empire at all!! the Empire used to be one of my favourite places. One of the few places you can actually see a rock band these days! Having said that, the true rock bands are getting thin on the ground. Now its tribute bands for all kinds of crap bands. Keep it rock! In fact give a slot to Willie Burns (with band) or even Paul Deane band. Where can you see those guys play these days? Glamorama on a fri night used to be good, until the 'gold chains and no brains' crowd discovered it. Last time I was there it was drunken middle aged hoods stumbling round, weighed down by Argus jewellery, annoying the life out of everyone. Bouncers of course do nothing about these halfwit 'da' types. So sadly I gave up on those Fri nights. So in my opinion its kinda gone to the dogs a bit. Agree with all comments below on the doormen here having major attitudes. it is haunted i was down stars at a gig it was the end of the night iwent to the toilets ther was no one else ther when i was leaving the bath room the doorman was leting people out the main doors this stops the toilet doors from opening in the gap in the door the doorman asked me to wate a minute i said ok and closed the cap inthe door somthing made me turn round when i did ther was a figure of a man standing behind me i got the shivers and all icould think of to say was are you ok mate he said nothing iturned back round i did not feel scared or that he was going to harm me. the figure had dark hair he was wearing ablack suit whith butons each side of his jacket i did not turn round to look again but when the door man opend the door to let me out i waited for a moment no one else left the toilets. Went for the house band night downstairs with a crowd of friends. Great music and atmosphere, as well as some dancing and whiskey! We'll definitely be back, absolutely superb! WHAT A NIGHT , FRIDAYS , ONLY ONE PLACE IN TOWN LOVE ALL THAT NOSTALGIC MUSIC , AND WHEN WE WANT A BREAK WE POP DOWNSTAIRS TO WATCH THE SALSA DANCING , MY HIPS COULDN`T TAKE IT . THE STAFF ARE ALWAYS NICE AND HELPFUL AND THE DOORMEN `YUMMEEEEEEE`,THEY EVEN GOT ME A TAXI AND HELD THE DOOR OPEN FOR ME .YES I AM OVER THE HILL AND IT IS NICE TO BE TREATED WITH RESPECT AND YOU GET THAT AT THE EMPIRE ALL YOUR STAFF ARE A CREDIT . WE WILL BE BACK , COUNT ON IT . great show on saturday night i went to see the rolling clones but the band Love You Live were great had a ball. im a big stones fan. I love this place, the Sunday nights are the best in Belfast. If it weren't for the bouncers I'd give it 100%. Not a bad place if you want a hassle free, mature type crowd who arent pretentious at all. Avoid the hell that is Glam-a-Rama on a friday night as its the same old regurgitated, kitsch crap they have been playing for what seems like the last 20 years! Good craic if you get a good cover band on and downstairs is decent most of the time. Would recommend comedy nite to anyone- great night out. Empire best place to be on a Tues night. After reading comments on the doormen dont know what to expect will be watching out for the friendly one! Great place to go with friends, fantastic music and Simon the bouncer is fit as!!!!! WENT TO THE EMPIRE SAT NITE TO C ROLLING CLONES. FANTASTIC !!! BAR STAFF WERE VERY FRIENDLY AND QUICK SERVICE. WOULD GO BACK AGAIN VERY SOON! The door staff have a major attitude problem. Can't even smoke OUTSIDE,have to go down the steps to the main street and get bothered by down and outs looking for cash. Best to go to Bar 12 the bouncers are a lot more customer orientated !!!!!!!!!!!!!!!!! I know what you mean about the doormen. it seems they just do a bit of eenie meenie, and if they think you're gonna buy a lot of drink, you're in. Somebody asked if it's really haunted. I'm not sure but there are some spooktacular bands play there on frightday nights. You can start off with a bit of grub downstairs first. They do a mean ghoulash and you can finish with Iscream before going upstairs. The doormen are a bit spooky. One acts the hard man but you can see right through him. I have been watching the Italy games for World Cup 06. Great bar with friendly people and staff. Good Guiness. Disabled Facilities "Our staff are delighted to provide special assistance to anyone who may require it."